Hello all, and happy Monday. It’s the start of a new week, after a very good couple weeks of ministry. 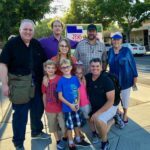 I spent a couple days week-before-last in San Francisco with SOS Ministries, and there were very good opportunities. Wednesday was at Fisherman’s Wharf (one of the biggest tourist destinations in the city), and Saturday was at UN Plaza. UN Plaza was quite an experience! It is the center of a lot of the homeless activity in San Francisco, but also gets a lot of foot traffic from the locals. 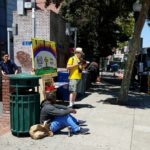 A local ministry called LOVE San Francisco organized the event, and many ministries took part. 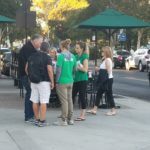 Although I couldn’t support all their ministry methods, there was a lot of really good Gospel preaching, and we spent the whole time in really good conversations. Praise God for that! This weekend was very good too. 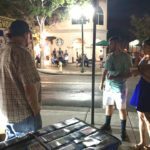 We spent Friday in downtown Campbell, and ended up with almost a dozen believers out sharing the Gospel. What a blessing and encouragement that was! That also meant that it was possible to do some sketch board presentations. Campbell generally doesn’t have heavy enough foot traffic, so I use banners or messages meant to catch people’s eyes. But a crowd draws a crowd, and others gathered to watch and talk when our group gathered. 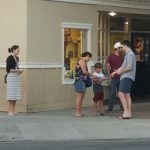 Saturday was even more active, with a number of believers joining us and very intense and interactive presentations on Pacific Ave in Santa Cruz. It was a great way to wrap up a week of ministry. I have a couple prayer requests. As I mentioned in my last post (see the link below if you didn’t have a chance to read it), I’ve been studying Biblical Counseling, and it is already showing fruit. 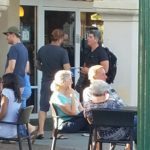 Please pray in particular for Dave, a man I met while street preaching and who I’m working with to deal with his drunkenness and get into a recovery program. I’ve also got a couple we know who are having serious marital issues, and who I am hoping will work with Becky (my wife) and I. Please lift them up in your prayers. This week’s public outreach schedule is below, along with a few pictures. Please pray for our upcoming outreach outreaches. Thanks! 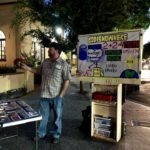 Anthony sharing the Gospel in Campbell. He brought his whole family along! A very good conversation following a sketch presentation in Cambpell. Our outreach group last Friday.